I came across multiple binary trading software scams recently, and Auto Money App is one of them. 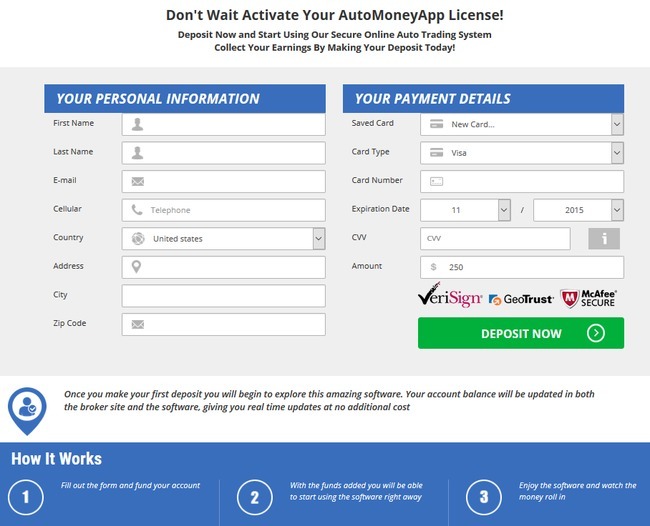 Before you deposit money into your account and use their app, make sure you read this Auto Money App scam review first. 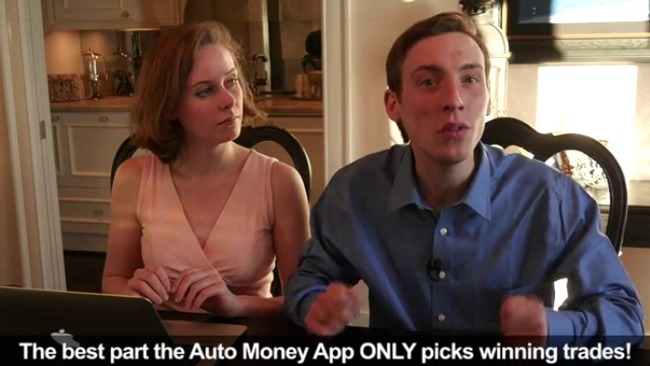 Like many other binary options scams, Auto Money App follows a predictable template in their homepage, much like Millionaire Blueprint and Free Money System scams by Walter Green. The homepage of Auto Money App doesn’t have any identifiable logo, instead you find an exaggerated statement and a fictitious sales video. 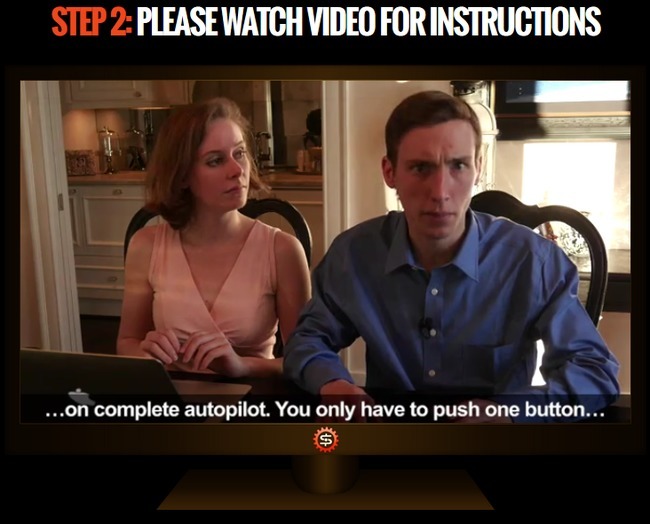 The sales video gives you false reports of a young teenager Daniel Rosenberg earning millions of dollars from his home, and claims that Auto Money App can help you do the same with just 1 click. For your information, the $500 billion dollar “loophole” that Auto Money App talks about is actually the binary options market. And it’s not a loophole that gives free money, at all. Quite ironically, although advertised as a free money app, Auto Money App is out to get your money. We’ll explain in more details below. Before we go any further into the review, let’s talk about binary options briefly to make sure everyone is on the same page. Binary options are gaining momentum in recent years due to its simplicity. However, being simple doesn’t mean it’s easy to profit from binary trading. Instead of reading financial news and analyzing charts, with binary options, you only predict if the price of an asset will rise or fall after a short period of time, usually between 30 seconds to minutes. There can be only 2 outcomes – either you are right, or you are wrong (hence the name binary options). For example, I predict the price of gold will rise 3 minutes from now, and I bet $50 on it. If I win, I’ll earn a certain percentage of what I bet, let’s say 60%. So if I guess correctly, I win $30. However, if I’m wrong, I lose the entire sum that I bet. Does it sound like gambling to you? There is no good way to predict the market movement in such a short period of time. Often time, you only depend on your guts feeling and make a guess. Even if you manage a 50% win rate, you’ll still lose money given the uneven winning vs losing payout. How Does Auto Money App Work? According to Daniel Rosenberg, the alleged genius trader and founder of Auto Money App, you only have to register for an account with their affiliated broker, deposit a sum of money, push a button on Auto Money App, and enjoy your profits. Auto Money App runs completely on autopilot and it will make you into a millionaire in 90 days. In fact, Auto Money App ONLY picks the winning trades, which means you will never lose money. Can you believe it? Seems like we are gonna be millionaires soon with this app! Not so fast. While it is true that you need to deposit a sum of money before using Auto Money App and that the app runs completely on autopilot, Daniel Rosenberg forgot to tell you something important – that you are making a huge mistake listening to him. Instead of turning you into a millionaire, you are actually turning Daniel into a millionaire by handing your hard-earned money to him. Disclaimer of Auto Money App. Despite promising you sky high profits and guarantees you winning trades, Auto Money App somehow doesn’t want you to view it as a “get rich scheme”. Also, despite claiming that the app runs on autopilot COMPLETELY, somehow your earnings depends on your own hard work and their is no guarantee you’ll make any money with Auto Money App. What happened to their promises in the sales material, and why does Auto Money App include such terms in their disclaimers? The reason is simple. The disclaimer is there to legally protect themselves when you lose all your money with Auto Money App, so you can’t sue them or take any legal actions against them. That’s why they need to have such document somewhere within their website. And do you know where can you find the disclaimer for Auto Money App? Scroll back to the first image in this review and look for “Earnings Disclaimer” at the bottom of the image. Why is Daniel Rosenberg Promoting Auto Money App Scam? 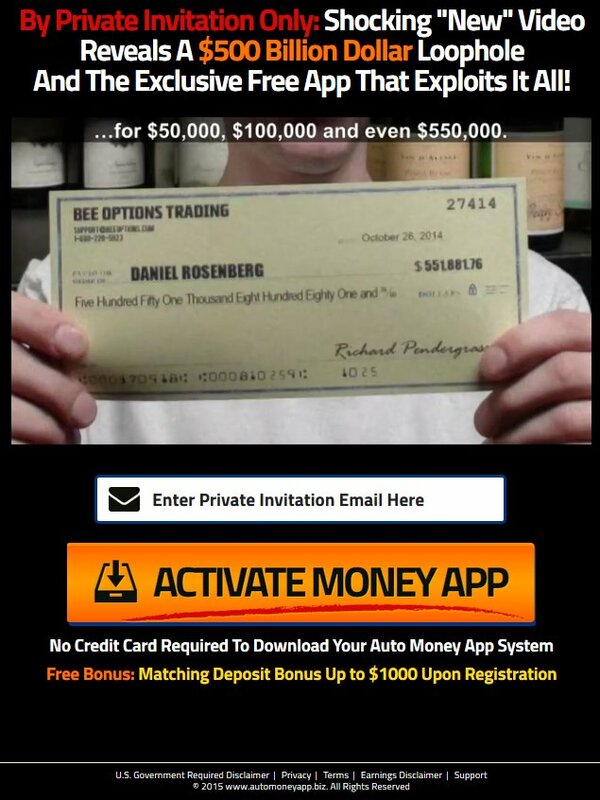 You may wonder why Daniel Rosenberg takes the effort to promote Auto Money App scam and gives it away for free, as long as they sign up with designated brokers. Firstly, if you decide to join Auto Money App and register for a broker account through their sales page, the team behind Auto Money App will earn a referral fee as soon as you pump in your first deposit. Not only that, Auto Money App makes money off you over the long term, too. 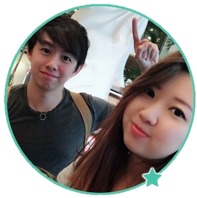 They earn a commission for every single trade that you make. Or rather, for every trade their app makes for you. Remember that their app runs completely on autopilot? That’s the scary part. The trading frequency is determined by them, which means they can control how much trading commissions they want to earn from you, as long as you still have money in your account. And they will profit regardless of whether you win or lose money, ALL AT YOUR EXPENSE. Should I Try Auto Money App? As we’ve said in the review earlier, we don’t recommend binary options trading as a way to make money online, at all. It’s not that different from gambling, and using an automated trading software is no different. You are essentially putting your hopes and entire investment in a piece of software that gambles on your behalf.